The Beechcraft T-6 Texan II is a single-engined turboprop aircraft built by the Raytheon Aircraft Company (which became Hawker Beechcraft and is now Beechcraft Corporation). Based on the Pilatus PC-9, the T-6A is used by the United States Air Force for basic pilot training and by the United States Navy for Primary and Intermediate Joint Naval Flight Officer (NFO) and Air Force Combat Systems Officer (CSO) training. It has replaced the Air Force's T-37B Tweet and is replacing the Navy's T-34C Turbo Mentor. The T-6A is also used as a basic trainer by the Royal Canadian Air Force (CT-156 Harvard II), the German Air Force, the Greek Air Force, the Israeli Air Force (Efroni), and the Iraqi Air Force. The T-6C is used for training by the Royal Moroccan Air Force and the Mexican Air Force. The T-6 is a development of the Pilatus PC-9, modified significantly by Beechcraft in order to enter the Joint Primary Aircraft Training System (JPATS) competition in the 1990s. A similar arrangement between Pilatus and British Aerospace had also been in place for a Royal Air Force competition in the 1980s, although this competition selected the Short Tucano. The aircraft was designated under the 1962 United States Tri-Service aircraft designation system and named for the decades-earlier T-6 Texan. The JPATS competition winning design was based on a commercial off the shelf Pilatus PC-9, with minor modifications. Additional requirements and conflicts between the Air Force and the Navy resulted in delays, cost increases (from initial estimates of $3.9 to roughly $6 million per aircraft) and a completely new aircraft that is 22% or 1,100 lbs heavier than the Pilatus. On April 9, 2007 the U.S. Department of Defense released their Selected Acquisition Reports, which reported that the T-6 JPATS program was one of only eight programs cited for Congressional notification for 25–50% cost overrun over initial estimates, which is referred to as a "Nunn-McCurdy Breach" after the Nunn-McCurdy Amendment. It is unusual for a program so far into full rate production to experience significant enough cost overruns to trigger this Congressional notification. The T-6A also replaced all T-34Cs with Training Air Wing SIX at Naval Air Station Pensacola in early 2005. T-6Bs have replaced all T-34Cs as the primary trainer with Training Air Wing FIVE at NAS Whiting Field. 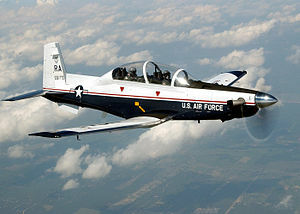 Training Air Wing FOUR at NAS Corpus Christi will continue to operate the T-34C as the primary trainer, with the arrival of their first T-6B in 2012. The Texan failed to qualify for the Light Attack/Armed Reconnaissance program, because the USAF mailed the exclusion notice to the wrong address, leaving the company with no time to protest the decision. But the official mail failure gave Hawker-Beechcraft a further legal justification, as they had told the USAF they planned to file a legal challenge even before the official notice had been mailed and brought its considerable political influence to bear against the USAF decision against their candidate with one Kansas Congressman stating "It is simply wrong for the Obama administration to hire a Brazilian company to handle national security when we have a qualified and competent American company that can do the job." In 2013, Beechcraft was once again the loser. The CT-156 Harvard II is a variant used for pilot instruction in the NATO Flying Training in Canada (NFTC)., located at 15 Wing, Moose Jaw, Saskatchewan. They are leased to the Royal Canadian Air Force by the program's administrator, Bombardier. NFTC's Harvard II aircraft are almost identical in cockpit layout and performance to the American JPATS Texan IIs. Within NFTC, students fly the Harvard II in Phase 2A and 2B of the training program, and some will go on to fly the CT-155 Hawk jet trainer also used by NFTC for Phase 3 (Moose Jaw) and Phase 4 Fighter Lead-In Training (4 Wing, Cold Lake, Alberta). The NFTC has 25 Harvard II aircraft owned and maintained by Bombardier. On 16 December 2009: The first 4 of 15 T-6A aircraft are delivered to Iraq under a $210 million contract. No AT-6 aircraft were included as was previously reported. This equates to an average of $14 million per aircraft with support and training included. The first 8 aircraft, purchased by the Government of Iraq, will arrive at Tikrit by the end of January 2010. The last 7, purchased by the United States, are expected by the end of December 2010. On 9 January 2012 Hawker Beechcraft announced the sale of six T-6C+ aircraft to the Mexican Air Force to be delivered starting early 2012 and replacing the PC-7 trainers used by the FAM. On 24 October 2013 Hawker Beechcraft announced a follow-on order of an additional six T-6C+ aircraft to the FAM, bringing the total ordered to 12. Upgraded version of the T-6A with a digital glass cockpit that includes a Head-Up Display (HUD), six multi-function displays (MFD) and Hands On Throttle And Stick (HOTAS), used at Naval Air Station Whiting Field. Armed version of the T-6B for primary weapons training or light attack roles. It has the same digital cockpit, but upgraded to include datalink and integrated electro-optical sensors along with several weapons configurations. Engine power is increased to 1,600shp (1193 kW) with the Pratt & Whitney Canada PT6-68D engine, and the structure is reinforced. Upgraded version of the T-6B with wing hard points, and intelligence, surveillance, reconnaissance capabilities. Mexican Air Force 6 T-6C+ on order, 6 delivered in 2012. Two Columbus Air Force Base T-6 Texan II primary trainers collided about 12:47 p.m. Nov. 28, 2007 near the Columbus AFB Auxiliary airfield in Shuqualak, Miss. (Gunshy Auxiliary Airfield) At the time of the accident, the aircraft were conducting flight training operations. On-scene emergency response located and confirmed all four pilots had parachuted safely. The Accident Investigation Board determined that pilot error was the cause of the mishap. September 24, 2010 A Laughlin AFB T-6 Texan II crew ejected when the engine of their T-6 failed. The aircraft crashed on a ranch 25 miles (40 km) east of Laughlin near the town of Spofford, Texas. The crew survived with minor injuries to the instructor pilot and a serious back injury to the student pilot. The aircraft was destroyed. The accident was the first USAF T-6 crash of 2010 and the sixth overall for the fleet. The Air Force determined the accident was the result of pilot error. The aircraft's instructor pilot accidentally shut down the engine, then applied incorrect airstart procedures, resulting in catastrophic damage to the engine. ↑ "Military" (PDF). Hawker Beechcraft. Archived from the original on 2008‐3‐9. http://web.archive.org/web/20080309170823/http://www.hawkerbeechcraft.com/military/t-6a/not_pc_9.pdf. ↑ USAF (undated). "80th Flying Training Wing". http://www.sheppard.af.mil/units/80thflyingtrainingwing.asp. Retrieved 2009-10-24. ↑ Trimble, Stephen. "Mail mix-up makes Hawker Beechcraft miss protest deadline for USAF contract; appeal filed in federal court." Flight Global, 27 December 2011. ↑ "USAF Determined on Super-Tucano for Afghanistan Even at Higher Cost." ↑ Bombardier Military Aerospace Training (November 2011). "NFTC The Concept". http://www.nftc.com/nftc/en/flash/nftc.jsp. Retrieved 2011-11-01. ↑ 10.0 10.1 10.2 Department of National Defence Public Affairs (March 2007). "CT-156 Harvard II". http://www.airforce.forces.gc.ca/v2/equip/ct156/index-eng.asp. Retrieved 4 November 2011. ↑ Department of National Defence Public Affairs (March 2007). "CT-156 Harvard II Specs". http://www.airforce.forces.gc.ca/v2/equip/ct156/specs-eng.asp. Retrieved 4 November 2011. ↑ Amynanet (undated). ">ΑΜΥΝΑ & ΔΙΠΛΩΜΑΤΙΑ 18. Εκπαιδευτικά αεροσκάφη". http://www.amynanet.gr/isoropia/18.htm. Retrieved 2009-10-24. ↑ 13.0 13.1 13.2 Bertorelli, Paul (October 2009). "NBAA 2009 Video Series: Hawker Beechcraft's Turboprop Attack Aircraft". Archived from the original on 24 October 2009. http://web.archive.org/web/20091024035927/http://www.avweb.com/avwebflash/exclusivevids/NBAA2009_ExclusiveVideo_HawkerBeechcraft_T6LightAttackAircraft_201365-1.html. Retrieved 2009-10-15. ↑ "Israel Requests Delivery of 25 U.S. T-6A Texan II Trainers". Defense-update.com. http://defense-update.com/newscast/0608/news/news1006_texan_il.htm. Retrieved 2013-10-25. ↑ Egozi, Arie. "Israel receives first four T-6A 'Efroni' trainers". Flight International, 13 July 2009. ↑ 19.0 19.1 "Mexico’s T-6C+ Turboprop Planes: SIVA’s 1st Counterpart". Defenseindustrydaily.com. http://www.defenseindustrydaily.com/mexicos-t-6c-turboprop-planes-sivas-1st-counterpart-07274/. Retrieved 2013-10-25. ↑ Hawker Beechcraft Corporation (undated). "Beechcraft AT-6". https://www.hawkerbeechcraft.com/military/at-6_ab/. Retrieved 2008-10-04. ↑ "GTRI helps transform a T-6 trainer into a light attack aircraft." Georgia Institute of Technology, June 15, 2012. ↑ T-6 Texan II, www.luftwaffe.de. Accessed July 11, 2009. ↑ "The Penny Drops: Iraq Chooses its COIN Aircraft". Defense Industry Daily. August 12, 2009. http://www.defenseindustrydaily.com/iraq-issues-rfp-for-coin-aircraft-03281/. Retrieved 14 August 2009. ↑ "Mexico compra en EU aviones militares para practicas" (in Spanish). Notimex. 2012-01-09. http://www.eluniversal.com.mx/notas/821430.html. Retrieved 2012-01-10. ↑ Air Force Link (November 2007). "T-6 Texan IIs collide". Archived from the original on 1 December 2007. http://web.archive.org/web/20071201004756/http://www.af.mil/news/story.asp?id=123077354. Retrieved 2007-11-28. ↑ USAF (undated). "Executive Summary Accident Investigation Board T-6A". Archived from the original on 2009-06-17. http://web.archive.org/web/20090617110208/http://usaf.aib.law.af.mil/T-6A_Columbus_28Nov07.pdf. Retrieved 2009-03-12. ↑ Tan, Michelle, "Crash report blames pilot who shut down engine", Military Times, 7 March 2011, retrieved 8 March 2011. Wikimedia Commons has media related to T-6 Texan II.